On Wednesday, April 25th, the Symbolic Youth Networking Council (SYNC) of the Symbolic Art Center program at Becker Middle School completed a month long campaign focused on child hunger in Southern Nevada. With their SYNC the Ship of Child Hunger project, SYNC collected 398 pounds of food that was donated to Nevada Partnership for Homeless Youth. NPHY serves thousands of local youth annually who suffer from food and shelter insecurity. SYNC students had the support of staff at Symbolic Art Center and United Way of Southern Nevada’s Volunteer Center, but they are the true stars of the project. We love seeing kids serving kids in our community! This project was made possible by a GenerationOn mini-grant as part of their national “What Will You Bring to the Table?” initiative. Thank you for helping us make an impact in our community, GenerationOn! Did you know that 1 in 5 kids in the U.S. struggles with hunger? Nevada is no exception. In fact, over 100,000 students in Clark County School District suffer from food insecurity, not knowing where their next meal will come from. As part of GenerationOn’s national initiative to raise 1 million meals for kids, United Way of Southern Nevada’s Volunteer Center and Las Vegas nonprofit, Symbolic Art, have teamed up for an awareness campaign and food drive to benefit Nevada Partnership for Homeless Youth (NPHY). The Symbolic Art Youth Networking Council (S.Y.N.C.) has designed, marketed, and coordinated a donation drive that is running for three weeks in April at their host school site, Becker Middle School. The campaign started with a kick-off event during the students’ Spring Break Camp. A representative from NPHY shared with the camp group about what child hunger looks like specifically in Southern Nevada. After learning more about the problem in our community, students worked on a picnic table that will serve as a place to collect donations during their food drive and be given to the NPHY drop-in center, where it will continue to serve Las Vegas youth long after the donation drive is over. Want to join the fight to end child hunger in Southern Nevada? Email volunteer@uwsn.org for more information about how you can help out in our community! Host a volunteering play-date over winter break. Instead of an outing to a park, host a community-focused activity such as making cards to deliver to nursing homes or sending care packages to soldiers. Deliver a meal to a family in need; Helping Hands of Vegas Valley needs drivers to distribute food to seniors. Start your own food, clothing, or toy drive. Collect items from your friends, family, co-workers, church groups, etc. and distribute to a charitable organization. Invite an elderly neighbor to join your holiday celebration, or offer to sit and chat with them a while. Gather a group and sing holiday carols to shut-ins or in shelters. Choose a family to sponsor from the Salvation Army’s Angel Tree program and bring the kids shopping to choose gifts for the family you will be helping. As you wrap the presents, talk about all the things your family is thankful for. Purchase $5 or $10 gift cards from a grocery store or fast food restaurant and deliver them to the Nevada Partnership for Homeless Youth’s plastic food drive. Decorate three jars: one for saving, one for spending, and one for giving. Ask your children to deposit their spare change equally among the jars over the next year. Ask them to choose an organization to donate their giving jar to. Visit a charity that you have supported so that your children see where the money goes. Take a tour and bring the whole family. Show how your efforts are making a difference. 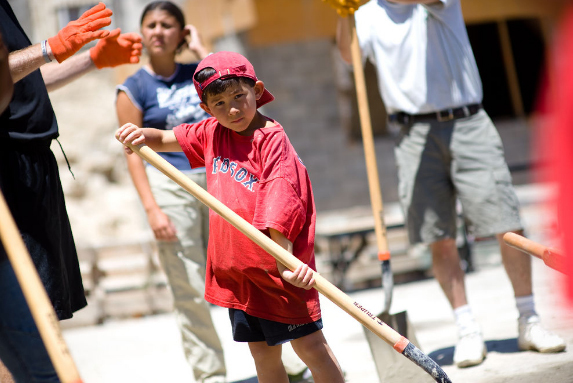 Create a scrapbook of your family’s volunteer and philanthropic experiences.